I always appreciate your insight and stories! Please keep them coming Roamer. With the largest agencies in the United States almost buying the RTS's exclusively in the late 70's/80's I just never understood why metro swouldn't have gotten in on the action. Now I know! Thanks again. Oh, well thanks, kionoa. I know some on this board told me once that they didn't want to hear me ramble on about my own experiences but others don't seem to mind it. It does me good and is therapeutic for me to reminisce as I'm getting up there in years, am in poor health, and having difficulty remembering things so sometimes it's good therapy for me to force myself to recall some of my earlier recollections about buses. Pertaining to the RTS and Seattle that I forgot to mention is that another thing the Metro insisted on (and it's been discussed on the Metro thread but to this day, I'm still not certain why they had this requirement) is they insisted that their buses have a rear window. They finally did away with that "rule" with orders placed after the Gillig Phantoms and NFI D60s. Therefore, the RTS series-4 which were being produced in the 1980s would have not met the procurement guidelines on both 1) having the lift on the front door, and 2) not being able to order the coach with a rear window (that's what I understood as I seem to remember that the a/c unit was either standard or they charged extra to have it removed and even if removed, would not install a rear window ...somebody with more knowledge on that, please feel free to correct me on this). And another quirky procurement requirement was they insisted that buses didn't need a/c as it would only be used for a few days a year in our climate and the maintenance costs are very high. The first bus with a/c was the D40LF and that was probably only because it was a piggy back order ...but it was around that time they came to their senses and started specifying a/c on future orders. Metro instead ordered Flyer D900s and MAN Americanas for their 40-foot fleet instead of the RTS during the 1980s. The Americanas had a relatively short wheelbase and were actually a pretty good bus to maneuver in and out of traffic as they had a relatively short wheelbase for a 40-footer but not a real tight turning radius. I really enjoyed both the Americanas and the MAN artics. 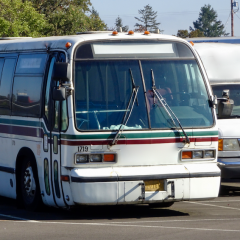 The 2100 series artics were actually the best handling bus I have ever driven. Even though I loved driving our fishbowls (700 series coaches), the 2100 artics, to me, handled like a BMW in comparison to anything else ...tight and precise steering with just a nice centered feeling. To tell you the truth, I too wish Metro would have had a few RTS coaches as I thought they looked so much more modern and streamlined compared to the competition ...especially the Americanas which everybody called breadboxes. Good points here. I know KCM was strongly opposed to the rear door lift. Remember, in the early 1980s most agencies weren't even specifying lifts; Metro was a trailblazer in this regard and was one of the first big city agencies to go 100% accessible in 1999. If you didn't care about having a lift at all in the 1980s, the RTS was a good choice and if you liked the RTS you just bought more and put up with the rear door lift. As a sidebar - I lived in Phoenix for two years. As busdude.com often puts it, "the legacy of the RTS lives on" and they spec their low floor coaches with rear door wheelchair ramps. It's awful. It is so inefficient and slow, not to mention difficult for the operator to position the coach to clear obstructions. There's no reason for it other than its always been that way (in some cities, whose first coaches with lifts were RTSs). Awful. So glad I'm not dealing with that any more. Finally, regarding Fishbowls and turn radius. Yeah, the RTSs had a long wheelbase. I've never driven one, but can imagine they gave up a bit of turn radius. Fishbowls, even with manual steering, had a shockingly tight turn radius ... you just had to have enough strength to get the wheel around. Spokane had a not-insignificant fleet of RTS coaches. Yes, you're so right about the lifts. Metro was the trailblazer pertaining to accessibility. Metro started training their drivers on the lift as soon as the D900s started to arrive on property and that was in the summer of 1980 I believe. What's interesting to me is the complete lack of interest by PNW transit agencies in the RTS buses. I never understood this as it was easily the most popular bus of the 80's and early 90's. I think community transit is the only PNW agency that even reordered the RTS's after an initial order. I've read multiple places that Portland drivers hate those buses. The RTS bus was the most common type here in Salem. Drivers loved them, they were luxury back in the day! You wouldn't happen to know which system Metro piggybacked the 3600's from, would you? Right. To the best of my knowledge the only WA agencies to have RTS were community, c-Tran, kitsap, and Spokane. Sorry about that. I'll shut up for awhile. Perhaps he mistook them for Grays Harbor Transit D40LF's that were piggybacked from Metro? While not on topic, its interesting to note that metro was ahead of the curve, and in-between 1979 and 1985 when all the AMG Trolleys, flyers, and MANs were delivered metro became largely W/C Accessible, probably more so than other agencies at that point. A lot of newer buses built in the mid-late 70s that were delivered w/o lifts were quickly relegated to spend the rest of their days in tripper service at an early age. When the Breda's were purchased in 1990 it left very little non W/C accessible coaches left in service. With such a large fleet there were only 75 or so MAN SG220s which were retired in 1999, and a small number of Diesel AMGs all of which were gone by 1996. All accurate. Metro's commitment to accessibility was so strong that a staff engineer designed the Lift-U lift that became industry standard in response to the terrible products on the market in the late 1970s. 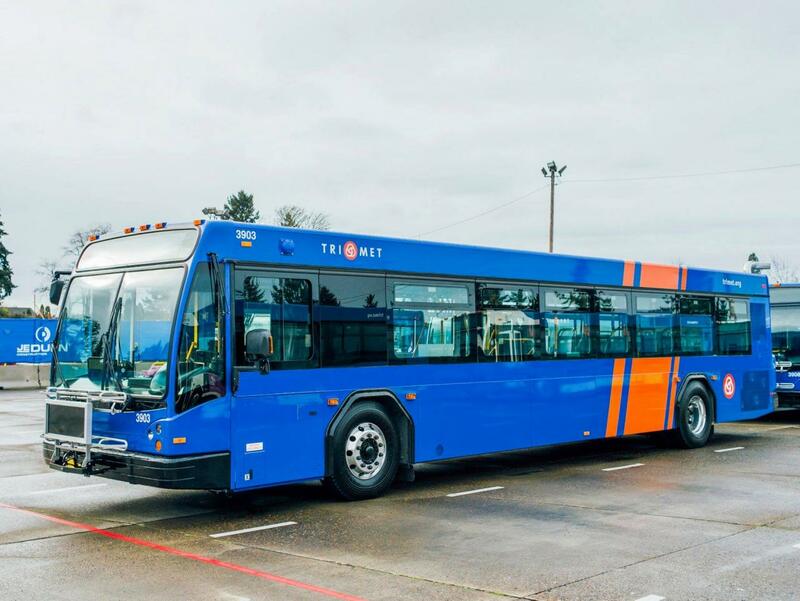 TriMet is rolling out their 3900-series Gillig BRTs along with a new livery. Built-in driver barriers on these. Any word on when the 3900's will be placed on the road? Thanks for the pic, but I am shocked at TriMet. By the standards of any organization, TriMet normally deals in outstanding graphic design -- web, print, signage, vehicles, decals. Their materials are crisp, informative, useful and professional -- and they're consistent across different mediums. It's a huge part of why TriMet is so successful. This paint scheme... I just don't get it. The colors are fine, even if the diagonal stripes are straight outta 1987. Mostly, though, this is wildly inconsistent with the TriMet aesthetic. It's like they asked the receptionist at Gillig to pick an off-the-shelf template and then just do whatever. I was thrilled when TriMet retired the old "brown beaver" scheme (though it's still visible on older New Flyers...) The "buttery circles" scheme introduced ca 2005 is attractive and versatile -- and it lends itself to other uses, such as the semi-circle bus stop blades, infographics, marketing items. This 'new' 1980s NASCAR scheme... I'd expect from a smaller, outdated system trying desperately to rescue its image. For a system of TriMet's calibre, this is a bizarre step backwards. Do you have any more insight into this unexpected change? Haha, understood! I'm not saying "is that a joke" to you -- I'm saying it to TriMet! They've been doing some cheeky things lately -- have you seen their officially produced "homage" rail maps? They've done the TriMet rail map in the style of other great rail systems. Like, imagine the TriMet rail system shown with the fonts, line weights, colors and styles of WMATA and BART. Pretty cool. Perhaps this weird bus paint scheme is part of that campaign?? Wait till they give the next-gen MAX trains a similar paint scheme. 17 years seems too soon for such a significant rebrand. Pre-installed driver barrier with a smaller sliding window than the demo units had. Electric front and rear exit doors (they have done away with the active strip on the door edge which means that when the doors are closed, they cannot be opened as in the previous models where you could pry the rubber and open the door - wait to see the first driver who gets locked out of a bus because of this). They are still really slow which hopefully TriMet can address. Reconfigured warning lights at the top light bar, moving the Brake, Stop Request, and Kneel lights to the bottom right side of the bar. 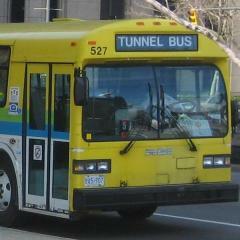 I've only been on 3915 - this bus had an odd issue where the rear wheels would stick when the interlock was released. You'd hear the engine starting up and the brakes in the rear would be holding the bus still - it was strange. That and the bus had a loose HVAC switch, so that it got spun around and off and on were reversed (it could be rotated in its place - from what I could tell this was addressed and corrected yesterday). Seemed like the transmission was allowing the bus to accelerate quicker - there was no noticeable reduction in torque from first to second that you hear and feel on the previous generations. Slow doors - Do we know TriMet wants them to be faster? Agencies are increasingly specifying agonizingly slow doors - someone in the safety department thinks this will cut down on claims. I think it just increases the operational block time, across all buses in the fleet waiting for the doors to cycle. My experience with the earlier Gilligs at TriMet is the rear doors are particularly bothered by the hard to use VAPOR Class passenger activated rear doors. From my observation - passengers would physical push the rear doors open as soon as the green light came on. As this occurred before the Class system had a chance to activate and start opening the rear doors, they would open very slowly. If one waited (as I did to test it, a couple of times) until the green light came on, then waived ones hand in the zone, the doors would pop open with a reasonable speed. The problem is the Class system is so unintuitive and unresponsive - literally no one in Portland is activating the doors properly. VAPOR's newer solid state rear door controls with a grab bar seem to work much better in other cities - TriMet could improve rear door operation if they went with that system. Interlock - Some agencies are spec'ing their coaches to require a certain psi brake application for the interlock to release. Gone are the days of doors are closed and push the accelerator. They want a conscious action from the driver to deactivate the interlock - doors closed, brake application - of a certain psi - then push the accelerator. What is Tri-Met's standard set up? What is the set-up on these coaches? Slow doors - certainly every agency who has these Vapor systems are dealing with the same struggles. I've seen the same issues in Honolulu as I have here in Portland with those Vapor doors. If the sonar sensors were more sensitive then it would be a lot better, but the added sensitivity would probably lead to false activations of the door latch. TriMet's spec is particularly challenging when it comes to door speed as the front doors are also attached to the interlock, but it seems like the closing of the rear doors are slower on these than their previous Gilligs. Sensitive Edge - You would think so, but it doesn't appear to be the case - my guess is that maybe the Vapor system has replaced this feature? In the case that I tried, the bus was off, and usually you can either put pressure on (aka kick) the back doors with the green light on and that would cause the doors to open. Now the system just beeps at you and doesn't open the doors. Now that I am thinking out loud, either the edge has gone from a sensor to open the doors to a sensor to sound an alarm, but the doors remain closed with the bus turned off. You can pry the rubber open or kick the door, and nothing besides the beeping seemed to happen. But the beeping happens, which means maybe that sensitive edge has a different function. Interlock - "They want a conscious action from the driver to deactivate the interlock - doors closed, brake application - of a certain psi - then push the accelerator." This is the case, but in this bus, the brake pedal was applied, then released, and when the gas pedal was applied the bus sort of "dragged" to start...as though it was a sticky caliper in the back. The interlock still functions the same as the rest of their Gilligs, but that dragging was unique to this bus (and potentially just this bus). 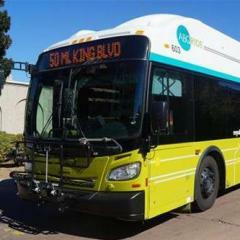 First XE40 is on the street in Portland--Line 62-Murray Blvd. Four more electric buses to electrify the route by summer.